Twenty-seven years after Scott Norwood missed the final kick that lost the Buffalo Bills the Super Bowl by the narrowest margin in history, the infamous kicker returns to the Queen City to appear in ONCE IN MY LIFETIME: A Buffalo Football Fantasy, a new play celebrating the city's resilience, hope, and dedication to its team. Buffalo, NY, September 05, 2018 --(PR.com)-- Bills’ Scott Norwood heads back to Buffalo to appear in ONCE IN MY LIFETIME: A Buffalo Football Fantasy. Scott Norwood, the kicker who embedded "wide right" into the national lexicon, returns to Buffalo, New York this Saturday to appear in a play about--what else?--the Bills winning the Super Bowl. Everybody in Buffalo - and probably football fans everywhere - remember the infamous “wide right” field goal that sent the Bills home without a Super Bowl trophy in 1991. It was the start of a four-in-a-row series of Super Bowl losses that was followed by a 17-year playoff drought. And “wide right” still shoulders the burden for the losing streak even all these years later. Probably nobody remembers “wide right” better than Scott Norwood, the 1991 Buffalo Bills kicker whose effort in the final seconds of the game birthed the now well-worn phrase. When Norwood returned to Buffalo after that ill-fated game, a crowd of well-wishing fans greeted him to show their love for both him and their team. It speaks volumes about both Norwood’s character and his resilience that he’s returning to Buffalo to do the September 8 closing night cameo in ONCE IN MY LIFETIME: A Buffalo Football Fantasy. 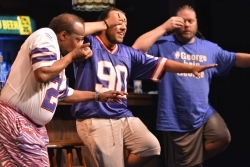 The show - which offers fans of theater, Buffalo, and the Bills, a chance to live out their dream - opened to sold-out houses on August 28, and has been the buzz of radio, television, social media, and print ever since. Everyone from WGR 550 SportsRadio's Paul Hamilton to the Bills Mafia don Del Reid are tweeting and talking about the show. Buffalo Boys Productions’ Chris Braun, a Western New York ex-pat now living in San Jose, commissioned and produced the play. Once the show took off, he thought an appearance by Norwood would be the perfect way to end the run of what has been his own once-in-a-lifetime dream. Norwood joins the ranks of Bills Elvis, Pinto Ron, Paul Hamilton, Josh Reed, and more who have made or will make cameos during the run. He appears September 8 at the 7:30 show and will take the final curtain call with the cast.